In contrast with the previous day, when I had the luck of very clear skies, on Christmas day a cirrus cloud front coming from the west made my plans for imaging the Moon…worth nothing. 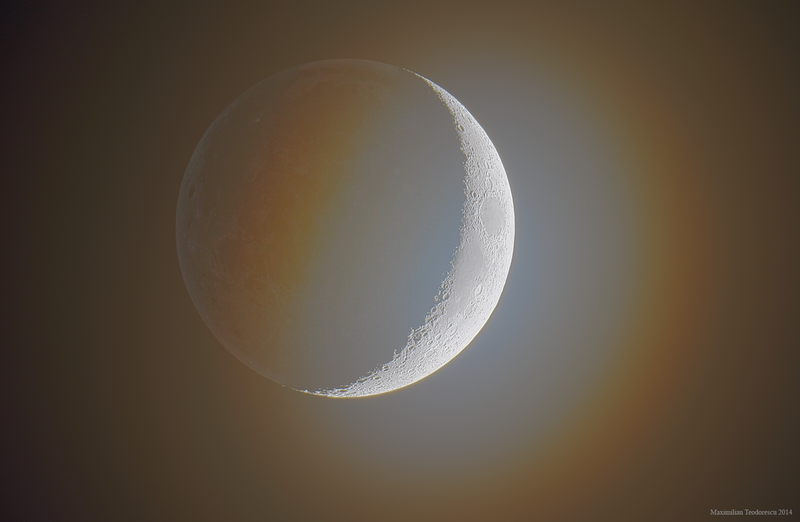 Still, using again the HDR method for getting both the very bright and the not so bright parts of the Moon in the same image, I’ve managed to get a combined shot showing both the Earthsine and Sun-illuminated part of the Moon glowing through some thin cirrus clouds. There is a halo (corona) enveloping the illuminated part of the Moon; this effect is due to refraction, reflection and dispersion of the light by the ice crystals in the clouds. The image was acquired using the same equipment as for the December 24th image. There is a new comet rising above the southern horizon each night now…it’s name is Lovejoy (C/2014 Q2). For now, due to the rather low altitude above the horizon, it can be only glimpsed in binoculars or a small instrument, but in about one week, the view will improve. It already reached Mag. +5, so it’s a naked eye object, theoretically at least. My first and only attempt at this “Winter Comet” was conducted in the night of December 24th, with the 4.5″ APO Refractor and Canon 550D at the focal plane. Fifty frames, each a 20 second exposure at ISO 3200, were combined into the following B-W image. The comet’s double tail is faintly visible, but this will change soon, clear skies permitting. 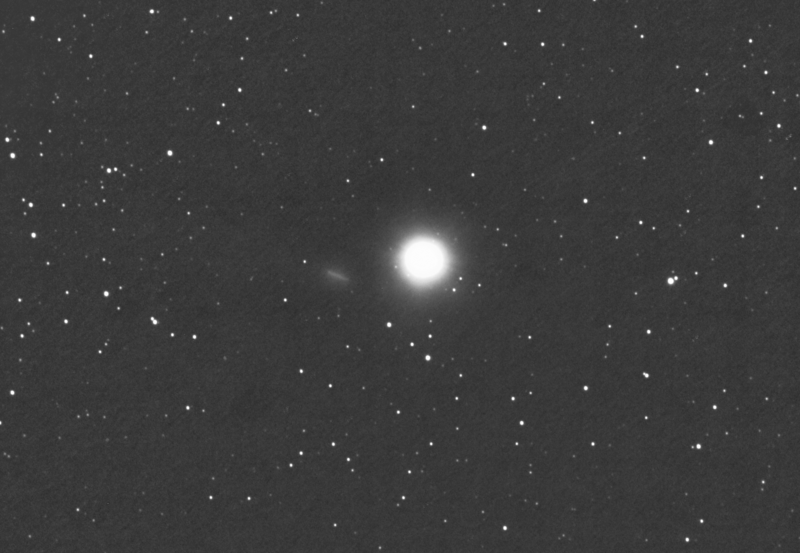 The estimated visual magnitude using a 8×50 finderscope was +5. Under dark skies and with the comet higher in the sky, the view of this greenish object should be superb. 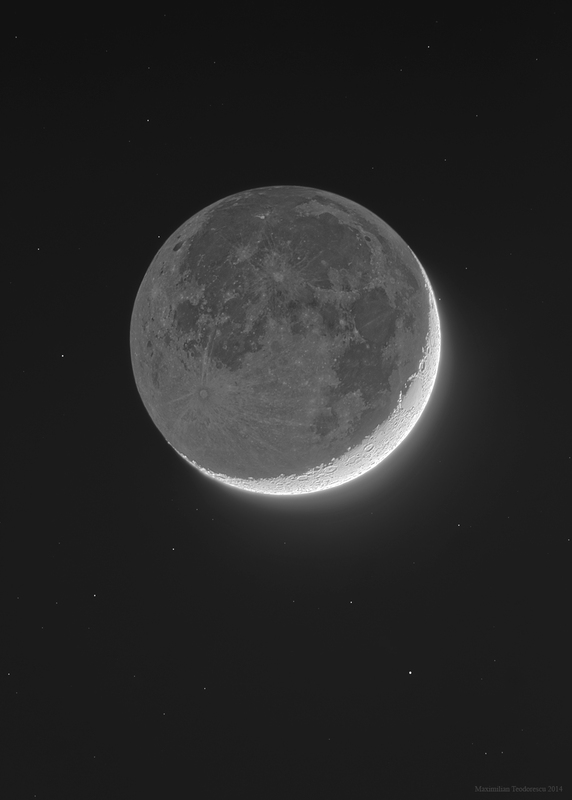 The above High Dynamic Range image of the Moon was accomplished on the evening of December 24, just a day ago. It’s the result of 20×7 frames acquired with different exposures and ISO settings. 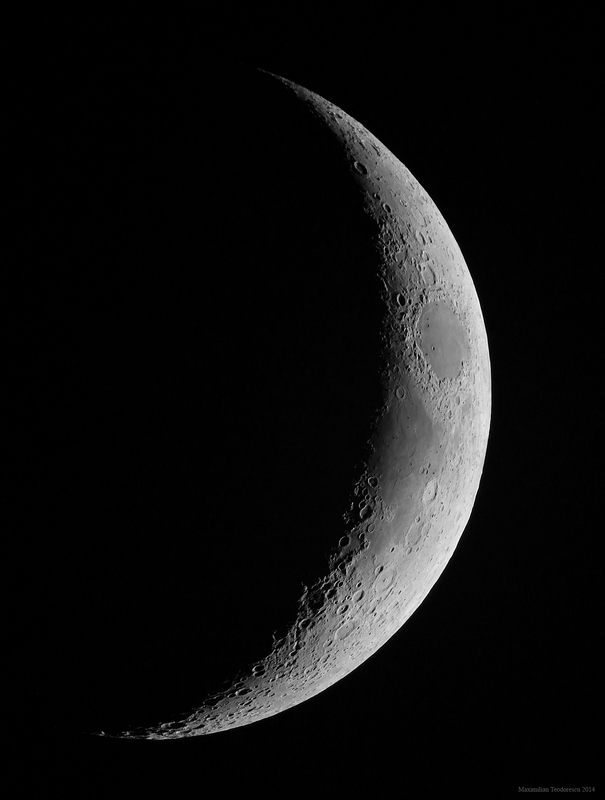 The setup included the 4.5″ APO Refractor and Canon 550D in the focal plane. Not too much ago, in October, we had a similar comet/planet meeting in the evening skies. Now, another comet is grazing (this time only apparently) the planet Mars. 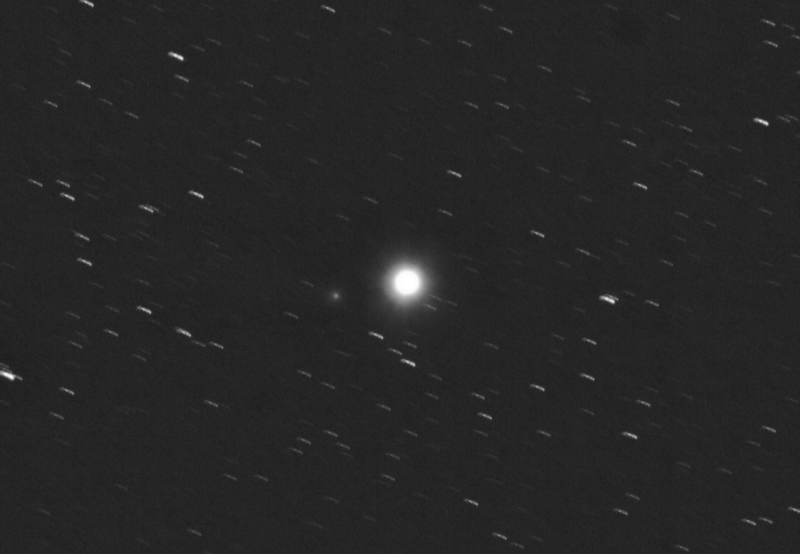 The rather faint periodic comet 15P/Finlay had an outburst in mid-December and that made it more easily visible and thus photogenic even in smaller instruments. The images below were acquired in the evening of December 24, on some rather good skies (after almost a month of clouds and fog) for my location, when together with my brother-in-law, I’ve decided to get my re-arranged equipment back in the field (a lot of repairs and refurbishing was necessary for both mount and tripod, but also some new accessories for the refractor). All images below were acquired with the TS APO 115 F/7 Refractor and Canon EOS 550D in the focal plane. For the comet, ISO 1600 was used with an exposure time per frame of only 20 seconds. The first image shows the movement of the comet during a 30 minute period, from 15:55 to 16:25 U.T. 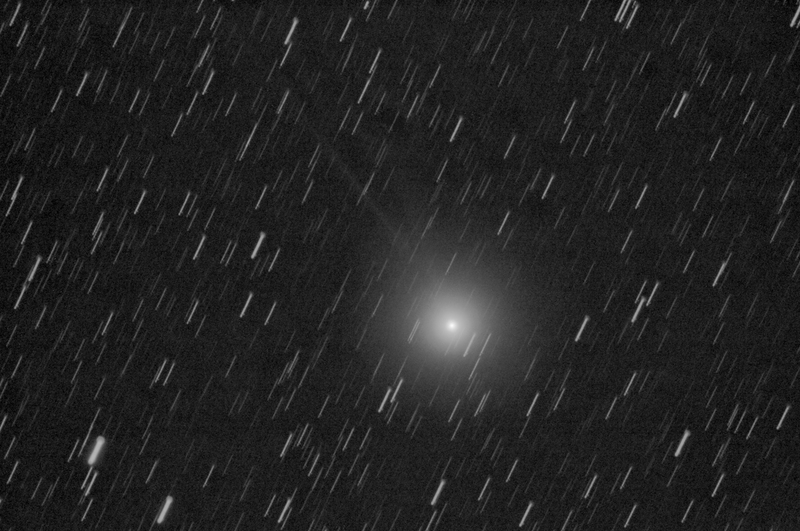 Mars is the overexposed ball near the center of the image, while the comet shows as a diffuse line. Nice first-session after a rather long period of closed skies. I’ll follow soon with an HDR image of the Moon from the same session.